Fun, Frugal & Meaningful Gift Ideas! Baby Shower Gift! You are here: Home / DIY / Fun, Frugal & Meaningful Gift Ideas! Baby Shower Gift! So, my next fun, frugal, and meaningful gift I want to tell you about is again from my Mom, the ultimate gift-giver! If you missed the first one it was a wedding gift, you can read all about it! My daughter and I have done this soo many times over the years and it is always a big hit! This one is a Baby Shower gift! We get a diaper pail, I know not many people use an old timey diaper pail anymore, but, I always used them for dirty clothes if not diapers. You could always just use a decorative basket, though, too. The original idea though is a diaper pail. So, you get your diaper pail, we always did this at the Dollar Store (my daughter and I), and were usually running late, so, I would drive and she would work putting it all together! So, back to the store, get a diaper pail and some sort of “clothesline” type thing, could be sturdy ribbon, actual clothesline, sturdy string of some sort, and clothespins, then we would get all the little things that no one thinks about. You know, after the shower you have all the big stuff: stroller, car seat, bed, clothes, diapers, wipes and blankets, all the needed items, except… nail clippers, powder, lotion, shampoo, baby wash, nail file, bulb syringe, baby scissors, cotton balls, Q-tips, tissues, travel sized items for the diaper bag. We would grab all those things and attach them to the clothesline with clothespins and put them in the diaper pail with the end of the clothesline attached to the lid of the diaper pail. So, when it is opened, you pull out the clothesline and it stretches across the room with all the items attached! This is always a great gift, it’s a big hit and it’s things people don’t think about getting and even the Mom-To-Be may not know she needs all these things! This is a very frugal gift, you can find many of these things packaged together at the Dollar Store and then break the packages up to add them individually to the clothesline. We would get baggies to put the things in that didn’t have a way to attach them to the clothesline. 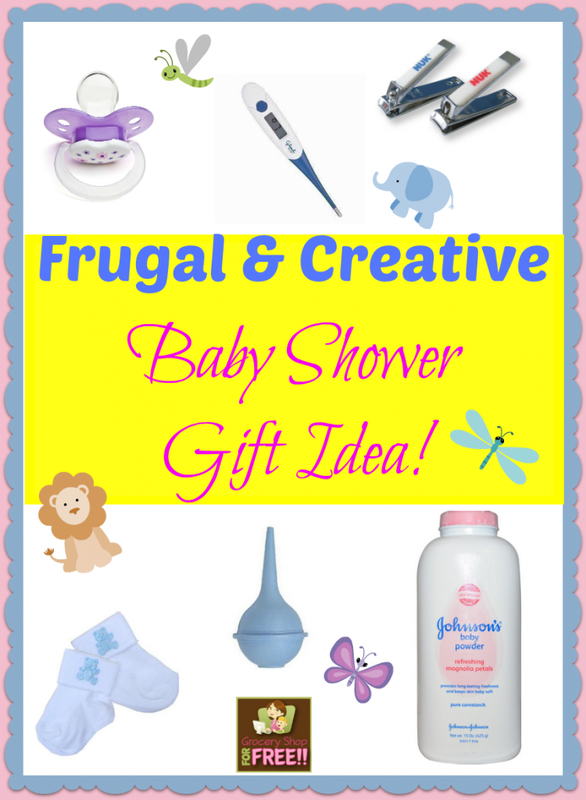 So, there you have a fun, frugal, and meaningful Baby Shower Gift! I kinda do something like that BUT I use my coupons. As soon as I find out they are pregnant, I purchase a LARGE gift bag at $1 store. I like the pail idea so I might start using that. Then I use my coupons for free items, many of those are sample sized and sign up for free diaper samples, etc and toss those into the bag. After about 6 months, the bag is FULL of child and baby items and everyone wonders how much I have spent. LOL I toss in toothbrushes for kids, toothpaste, and always add something for other siblings and something for Mom and Dad. I also add coupons for FREE meals for their freezer or when the baby is born, their choice and give them an idea of types of meals we make. For weddings & graduations: I take a laundry basket and throw in those things you NEVER think of- picture hanging kits, assortment of nails, hand tools, garbage bags, dish soap, laundry soap, toothpaste, toothbrushes and anything else I can think of. I even offer to show them how I mange to save so much using coupons and help them set up their own couponing system. Great idea! I usually do a diaper cake with inexpensive diapers and wipes.